What's New on the GSRSV Website? Is a German Shepherd the Right Breed for You? German Shepherd Rescue of Sacramento Valley (GSRSV) is a tax-exempt (501-c-3) charitable organization dedicated to finding good homes for German Shepherds and German Shepherd mixes whose caregivers can no longer keep them or which are confined in animal shelters and potentially facing euthanasia. Established in 2001, GSRSV is operated primarily by one person, Brian Foran. GSRSV houses some of its adoptable dogs at its 45-acre "rescue ranch" in Pleasant Grove, CA, which is also a sanctuary for "unadoptable" dogs as well as Brian's home. GSRSV has a small but steady network of foster caretakers who care for rescued dogs in their homes until they are adopted. "Rosie" is an exceptionally sweet 5-yo female longcoat GSD available for adoption at the Stockton shelter. (The shelter Website lists Rosie as a GSD mix, but she appears to be a purebred longcoat.) She was picked up as a stray on March 27 and was not claimed by her owner. Rosie is very affectionate and loves to be petted, as pictured in the video linked to here. Her regular adoption fee is $114.50. Please contact the Stockton shelter at 209-937-8274 to check on Rosie's status before going to visit her. The shelter is open from noon-5:00 PM Tues & Thurs-Sun, and from noon-6:00 PM on Wed. Refer to Rosie by her ID #: A277647. 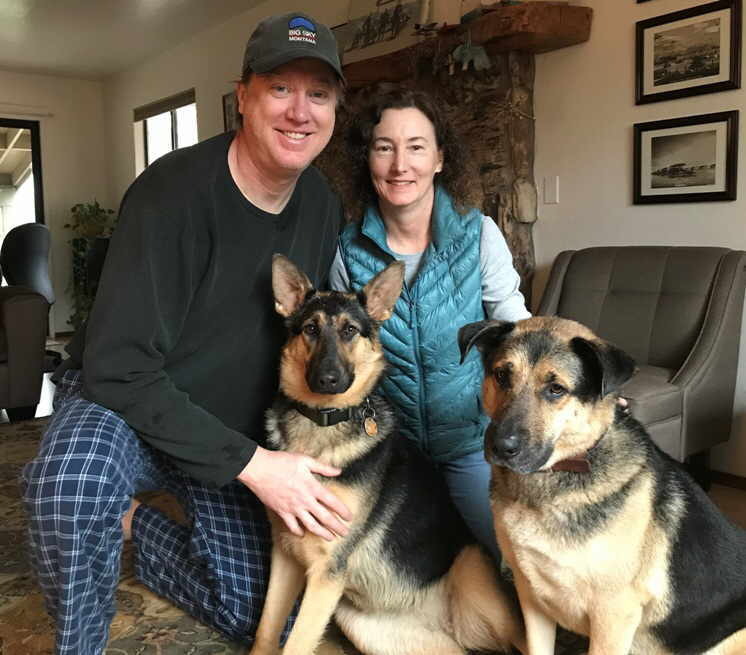 As of Jan 1, 2019, GSRSV is no longer assisting people in rehoming their dogs due to a pending move to Central Oregon. For assistance in rehoming your dog, please contact Cara Kinzel of The Underdog Railroad (www.facebook.com/underdograilroadtransport) at theunderdograilroad@gmail.com. Another resource to help you rehome your dog is www.rehome.adoptapet.com. If you are looking for a wider selection of purebred German Shepherds in Northern California, please visit the Websites of Bay Area German Shepherd Rescue (based in Novato), El Dorado County German Shepherd Rescue (based in Shingle Springs), German Shepherd Rescue of Northern California (based in Cupertino), Golden State German Shepherd Rescue (based in Alameda), Greater California German Shepherd Rescue (based in Modesto), Second Chance German Shepherd Rescue (based in Walnut Creek), Shep Heroes (based in West Sacramento)and Sierra Nevada German Shepherd Rescue (based in El Dorado Hills). 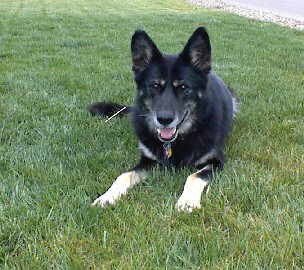 If you are considering adopting a GSD directly from a shelter (and I encourage you to do so), the best Website to search for shelter dogs (of any breed) is www.petharbor.com. Be sure to include shelters from a wide radius (at least 50 miles) from your city or zipcode in your search. On September 20, 2018, the FDA issued a communication for pet owners and veterinarians warning about the potential for neurologic adverse events following the administration of oral flea & tick control products to dogs and cats that contain isoxazoline-based ingredients. These products, available by Rx only, include Bravecto, NexGard, Simparica & Credelio. Click on the four selections in large font in the menu to the left, starting with "Dogs Available for Adoption through GSRSV." If you're interested in adopting a dog available through GSRSV, read the page "How to Adopt a Dog from GSRSV." That page describes my adoption process, and includes my adoption questionnaire and adoption contract. Please hold off on filling out the adoption questionnaire until after the next step! 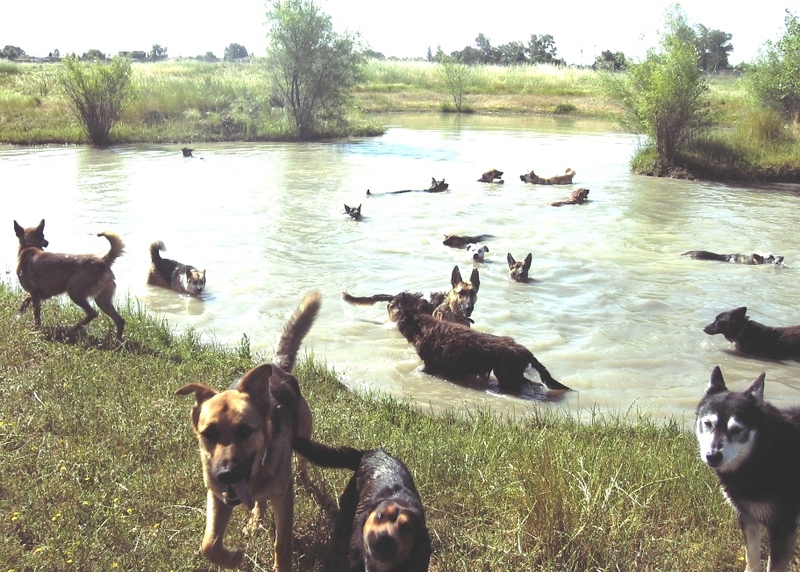 Contact Brian Foran at 916-655-3125 or bab43@msn.com to learn more about the particular dog(s) you're interested in. If the dog seems like a good match for you, I (Brian) will ask you to fill out and submit the GSRSV adoption questionnaire. If you're interested in adopting a dog from another rescue group, an owner, or a shelter, contact the person or shelter listed for that dog. I'm sorry to bombard the homepage of this Website with urgent appeals to adopt GSDs & GSD mixes in shelters facing euthanasia. I know it's no fun for those of you not in a position to adopt or foster these dogs to see such heart-wrenching posts. Nonetheless, everything must be done to try to save these dogs, and posting to this homepage ensures that most visitors will see the appeals. The dogs facing euthanasia featured on this Website are not rare instances. They are only a sampling of the many, many GSDs (and of course, other dog breeds) facing euthanasia in California shelters every single day. To many, this is shocking. To those of us in the rescue field, it is a grim reality. Rescuing dogs is not the answer--stopping indiscriminate breeding is. Please do all you can to encourage people NOT to buy puppies--even from those whose dogs "accidentally" had puppies-- and to spay/neuter their dogs. 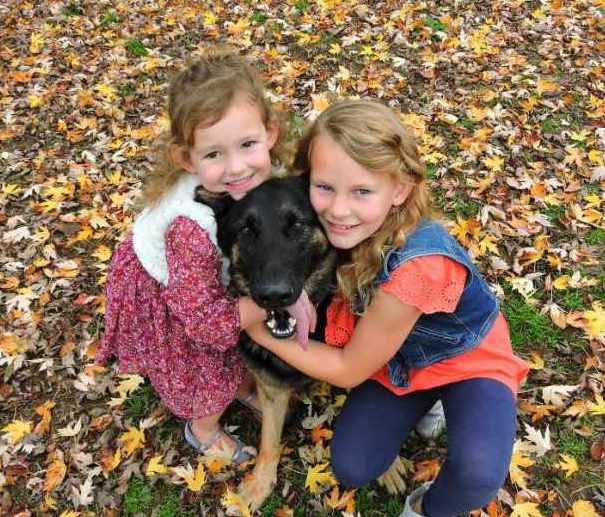 If you are seeking to adopt a GSD, please consider adopting directly from a shelter. Both the Stanislaus County Shelter in Modesto and the San Joaquin County Shelter in Stockton always have a surplus of wonderful GSDs available for adoption. Many of these dogs will not make it out alive because the inflow always exceed the number of dogs either adopted or rescued. 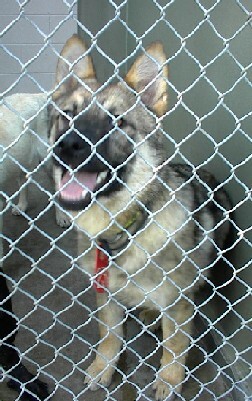 To search on GSDs (or any other breed of dog) at the Stanislaus and San Joaquin County shelters, start at www.petharbor.com. Our most recent adoptions were Lady to Andrew Martinez of Sacramento (left frame); Jasper to Dr Lisa Teske, DVM, of Solvang (not pictured); Roscoe to Andrea & Steve Barnett of Elk Grove (center frame); and Zoe to Betsy & Gene Bowen of Placerville (right frame). 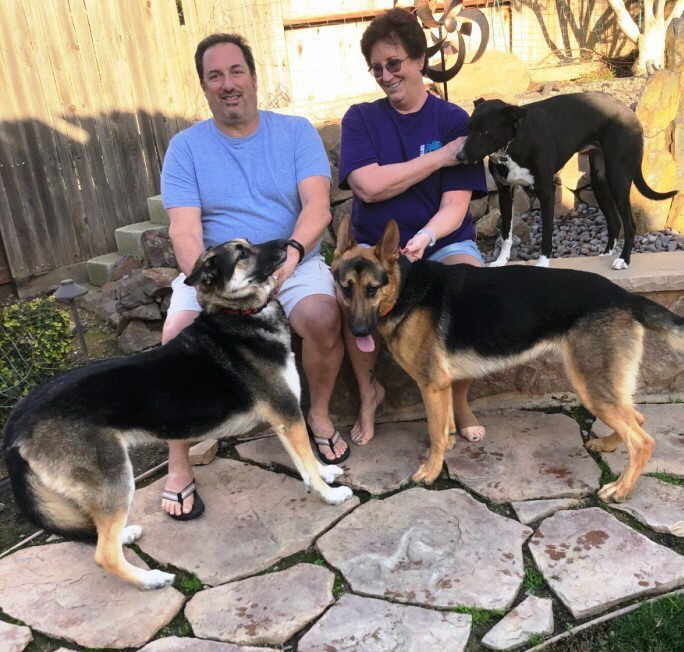 So far in 2019, GSRSV has placed four dogs, including two "Program Dogs" who I placed for their owners. See our 2019 Rescue/Adoption Record. 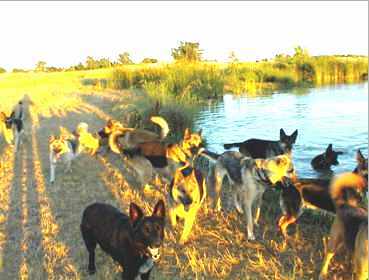 In 2018, GSRSV rescued eighteen dogs and placed twenty-eight dogs, including eleven "Program Dogs" who I placed for their owners or caretakers. See our 2018 Rescue/Adoption Record. Seeking rental housing that will allow you to keep your German Shepherd? Can pictures get any cuter than these? That's Tristan with Sally (adopted 2-18-18) at left and Joceylyn & Rylee with Dually (adopted 5-13-17) at right. GSRSV is a tax-exempt public charity, as defined under Section 501(c)(3) of the Internal Revenue Code. All donations to GSRSV are tax deductible to the full extent of the law. Since February 2001, Brian Foran has funded GSRSV primarily on his own. Brian runs a large rescue facility/sanctuary by himself, and typically has more than 25 dogs to feed and care for! Many of these dogs are either too old for adoption or have been returned to GSRSV more than once--and thus are allowed to live their lives out at the rescue facility. Brian has never returned a dog he has rescued to a shelter--NEVER! Donations have played--and continue to play--a huge part in keeping GSRSV afloat, as adoption fees are a drop-in-the-bucket compared with the costs of running a large rescue program. GSRSV has earned the designation of a "Top-Rated" nonprofit organization for 2018 from Great Nonprofits.org, a clearinghouse for NPOs. GSRSV, PO Box 652, Pleasant Grove, CA 95668. You can add a message to GSRSV in the PayPal payment window. Just click "Add special instructions to the seller" and a text box will open. Any size donation is appreciated. Please help in any way you can! You can also contribute financially to GSRSV without spending an additional cent by shopping at AmazonSmile, Amazon.com's charitable donation program. See below. Don't just take your dog for a walk.....take your walk for a dog! Go to WoofTrax.com, download the app to your smartphone, and support GSRSV every time you walk your dog! The more miles you walk, the more WoofTrax donates to GSRSV! GSRSV was the recipient of a donation in Dec 2015 by Kritika from the proceeds of her commissioned painting of a GSD puppy "Lexi" (see right). If you would like to immortalize your dog or cat in a beautiful (yet affordable) painting and help support GSRSV or another animal welfare organization, please visit the "Pet Project" of Kritika's Lone Tiger Art Website. Is fostering a dog a sacrifice? NO! It is a pleasure! 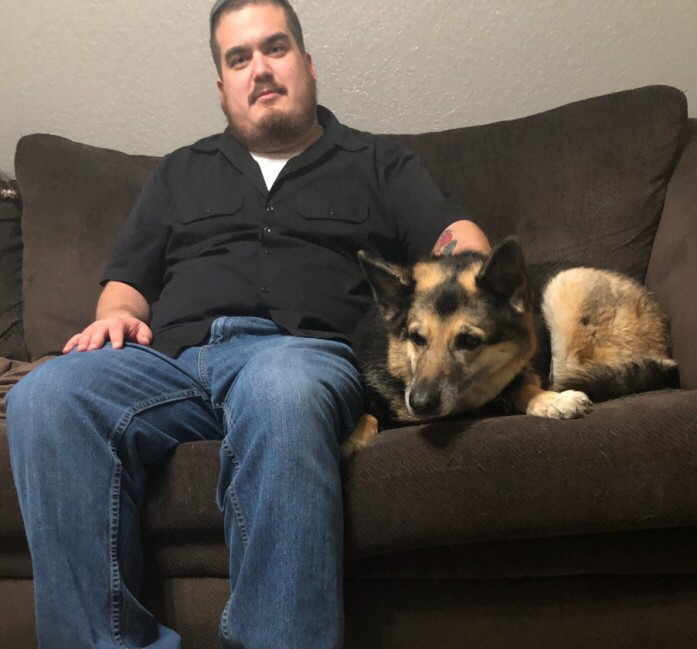 The rewards of knowing that you've saved the life of a sweet, beautiful German Shepherd dog (or any other breed), and made that dog feel loved, are MUCH greater than whatever inconvenience the dog may cause or the pain of letting him or her go to a new home. If you, the German Shepherd-loving community, will not extend a helping hand to the numerous German Shepherds housed in area shelters and facing euthanasia, WHO WILL? PLEASE consider fostering a German Shepherd for GSRSV! 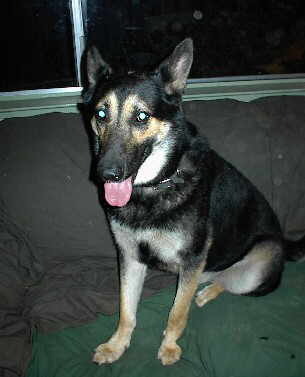 See the page Save a German Shepherd's Life: Become a Foster Caretaker. Though there are certain advantages to adopting a dog from a rescue group, those dogs are safe. Most in shelters are at high risk of euthanasia! 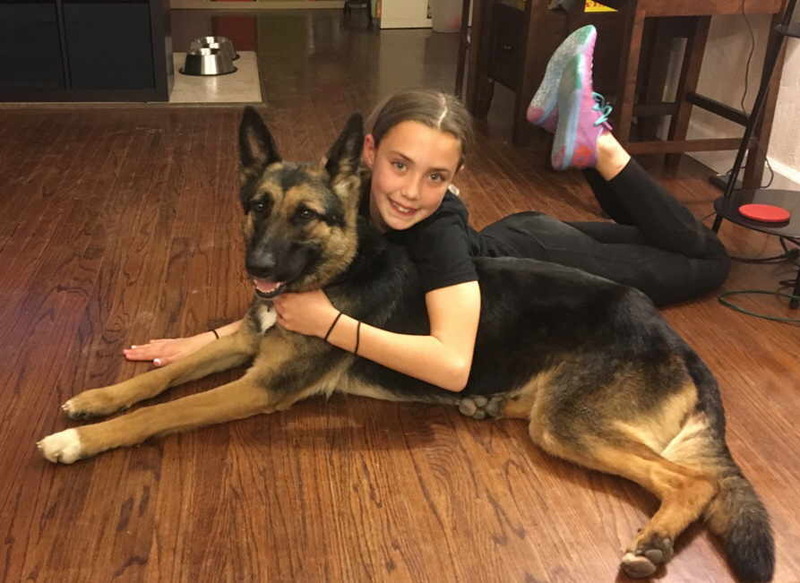 If you don't already know, you'd be horrified to learn about the number of beautiful German Shepherds that are euthanized every week in Northern California shelters. Think you can't find a purebred German Shepherd at a shelter? 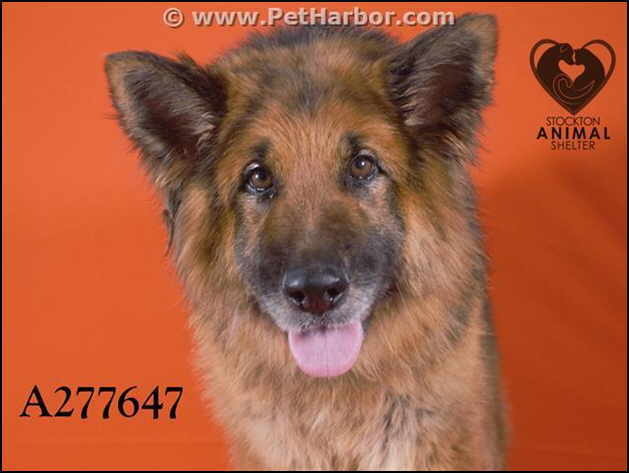 I have found the best Website to search for a GSD in a shelter near you is Petharbor.com. This Website allows you to specify breed as well as to select the shelters from which you'd like to search for a GSD to adopt. You can also request to receive automatic e-mail notifications when the shelters that you specified have GSDs available for adoption. 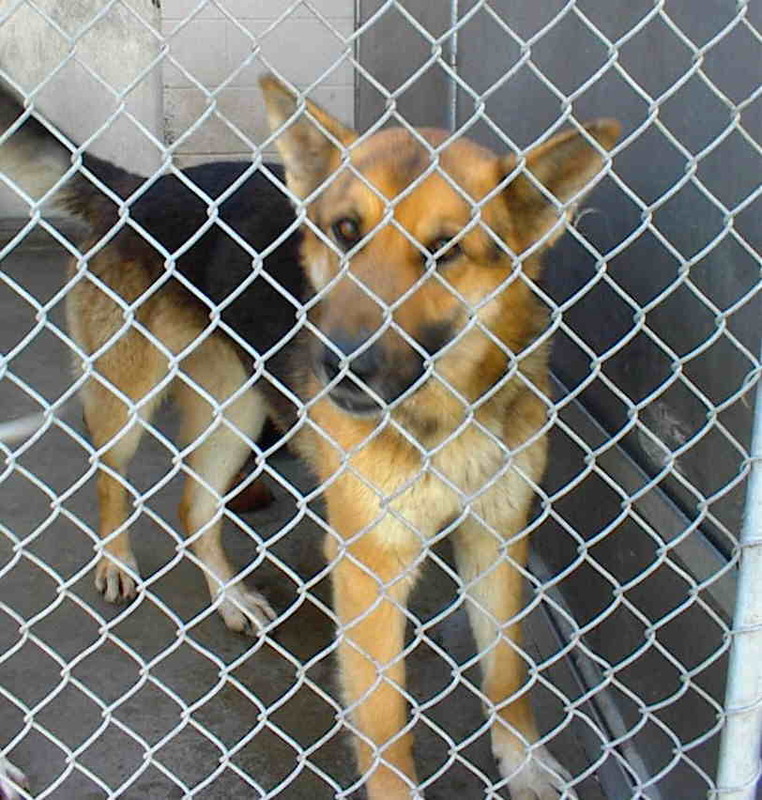 The NorCal shelter with the most GSDs is probably the Stanislaus County Shelter in Modesto. They often have in excess of ten GSDs! 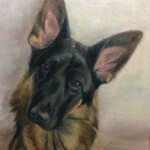 Cara Kinzel has created a Facebook page profiling many of these GSDs, most which she has met and evaluated in person. Please Remember that Most Dogs with Rescue Groups Come from Shelters Themselves! Send me your favorite photo and/or story of the dog(s) you adopted from GSRSV, and I will post them on the GSRSV Picture/Story Scrapbook page. Mail pictures/stories to Brian Foran at bab43@msn.com. Older Rescued Dogs Make Wonderful Companions! Think that an older dog will not make a good family companion because it's too set in its ways?" Think again! Older dogs, more so than younger dogs, live to please their caretakers. Furthermore, hip dysplasia in older German Shepherds is much less of a problem than commonly believed, and general arthritis is readily treatable with coated aspirin (yes, ASPIRIN) and glucosamine/chondroitin supplements. For an excellent information resource on older dogs, see the Senior Dogs Project Website, and their "Top Ten Reasons to Adopt an Older Dog." 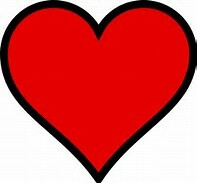 "Krista has become a wonderful friend--so gentle and friendly that everyone enjoys her. She is an excellent example of why adopters should consider older dogs." If you have or plan to adopt a GSD, you NEED to know about "bloat!" Please read the info below. Gastric dilatation/volvulus, more commonly known as "bloat", is an all-too-frequent, often fatal event for German Shepherds. Basically, gastric dilatation refers to a condition in which the dog's stomach fills up with air due to various circumstances. The dog's abdomen becomes visibly "bloated", and causes great discomfort. If the bloat persists, often what happens next is volvulus--the stomach literally rotates on its intestinal axis, shutting off the blood supply both to and from the stomach. At this stage, the dog usually has only hours to live, and the condition must be treated surgically. The sooner the dog is treated, the better its chance for survival and full recovery. Learn how to avoid bloat in your dog, and how to recognize the symptoms. Please click on this link to open a very informative Webpage about bloat. I recommend printing the article and placing it where you can immediately access it if you suspect that your dog is experiencing bloat. Click on this link for a printable MS Word version of the article. Click here for more info and to sign up for their newsletter. Springtime, Inc., is a manufacturer and retailer of amazingly effective, all-natural, reasonably priced nutritional supplements for dogs, horses and humans. I have regularly given a few of Springtime's supplements to the GSRSV dogs for years, and enthusiastically endorse these products--particularly "Joint Health"--a glucosamine/chondroitin/MSM supplement, and "Bug-Off Garlic"--a natural flea preventative that REALLY WORKS! Please visit Springtime's Website, and if you place an order with them as a result of this referral, please mention that you learned of their company through GSRSV. I do not receive any commisions--I just want the people at Springtime to know that I'm sharing the word on their products, as they do give me a discount on the products that I order. for listing GSRSV's adoptable (and adopted) dogs on their respective Websites. Thanks also to (www.comslider.com), a superb slideshow development and hosting Website, for hosting GSRSV's adoption picture slideshow free of charge. 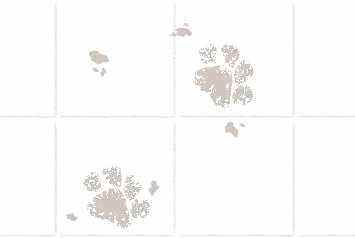 This site is hosted by (www.xmatters.com). xMatters specializes in "intelligent communications" for businesses, particularly for the IT component of those businesses. Many, many thanks to Troy McAlpin, xMatters' President & CEO and a former GSRSV adopter, for graciously hosting GSRSV's Website on xMatters' servers since 2001.